Our garden is producing a bumper crop of pickling cucumbers! I now have two full crocks of refrigerator pickles, but not even a pickle craving pregnant woman nor a Midwestern pickle-consuming husband can keep up. So Hubby decided to dust off his old recipe to can some pickles. A delicious fact about my Hubby is that he loves to cook - french toast, big dinner meals, yummy cakes (he makes me a birthday cake from scratch), and pickles. Sterilize jars in rolling boil in large pot. 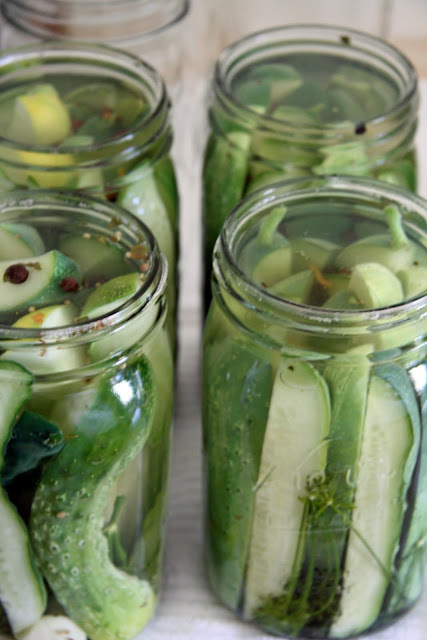 Pack cucumbers tight in sterilized jars with seasonings. Bring brine to rolling boil. Pour brine in jars. Let sit for 10-15 minutes, until cucumbers begin to turn olive. Pour brine back into pot and bring to second boil. Fill jars with brine again, to 1/4-1/2 inch from top. Secure sterilized lids on full jars, and allow to cool. After jars have cooled, check that lids have sealed. Let cure for three months. Will have to give it a go. I love making jam so will put this on my list of things to make. All about slow living. they sound yummy..even if you do have to wait for them to cure! how are you feeling..despite being swollen? 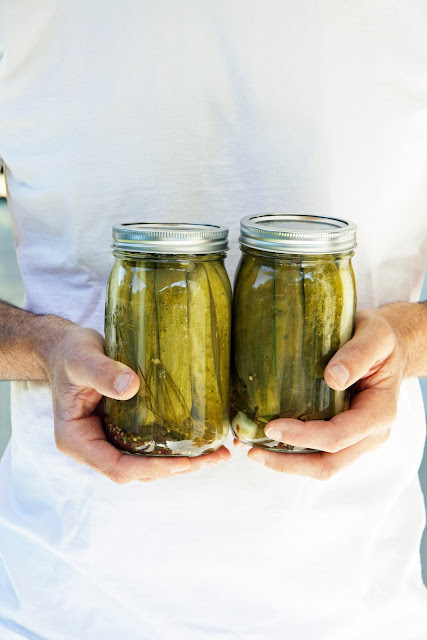 I am one pickle-lovin' fiend, and these look so delicious! Hope you and the little ones are doing splendidly well. I read in 'Real Food For Mother And Baby' that protein helps against water retention. It's a wonderful book by Nina Planck. How wonderful your husband likes to do those kinds of things! Found you on Piney Flats Style...love you blog and can't wait to spend more time looking! I love a good pickle with a corned beef sandwich. Hubby's canned pickles look so yummy.Waiting three months to eat one is going to be difficult I bet. Just thought I would let you know I featured you on my blog today! Hope you dont mind! Looks good, I might try out your recipe. Our cucumbers are going nuts this year too! yum,a husband that cooks. and the pickles look fantastic too. You make me want to grow some cucumbers so that I can try this!! They look delicious! And I LOVE your blog! I also live in a farmhouse (though it still needs a lot of work!) I am loving the inspiration! I was totally inspired by you Refrigerator Pickles and I used your recipe last week - they were delicious. I even pulled out my mother-in-law's Polish pickled mushroom recipe and made those too. Thanks for the inspiration! Love the idea. And thanks for the recipe. I have never tried canning before, but I hope to soon! I've been reading your blog, and thoroughly enjoy it! Congratulations on your baby(s) to be!! yummy. i also am a swollen pregnant woman and i am loving pickles right now. now if only i could try and can some myself :) love your blog! What a yummy post! I feel like a sandwich..a cuban sandwich to be exact! And a nice big pickle to go with it!! Oh and some Honey Dijon chips made by Kettle would be the perfect compliment!! I made your hubby's french toast over the weekend. Those additional spices were fabulous! Both my little boys ate more than their share and neither is typically a huge french toast fan. Thanks so much for the recipe! Just wanted to invite you to my "Canning Week Blog Party" that I'm hosting on my site this week. We are daily posting tips and recipes as well as having give-a-ways and a linky party all in hopes of getting bloggers educated and encouraged to can on their own. HOpe you can stop by, link up and join in the fun!!! I just found your blog while blog-hopping and wanted to let you know how much I have enjoyed it. Congratulations on your twins! How exciting for you and your husband. We also struggled with infertility after our first son was born and we ended up adopting...3 times! We are finally complete with our 4 now and life is wonderful...busy, but wonderful. I have a question for you...are the wood floors in your dining room original or did you put them in after you purchased the home? I would love to know what kind of wood they are and how wide they are...Thanks! The dining room was added on during our remodel. We were quite adamant with our contractor that this new addition look original to the house, so many decisions were made to try and achieve that. One of those decisions were the floors. The adjacent hall and kitchen had original fir floors so the hardwood floor guy matched new fir to the old ones. It was our task to find a stain that would make the two blend, which wasn't easy. 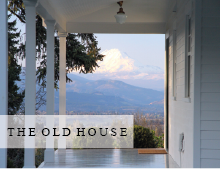 This was because although we had refinished the original fir floors in the hall and kitchen a few years ago, they were of different age and took stain quite differently. So we did a lot of samples! So long story short, we used fir floors and sampled different stains to match the existing refinished floors that were original to the house. Thank you Trina! They are beautiful. Yummy.... off to eat a pickle!! How much picking slide do you add to each jar? 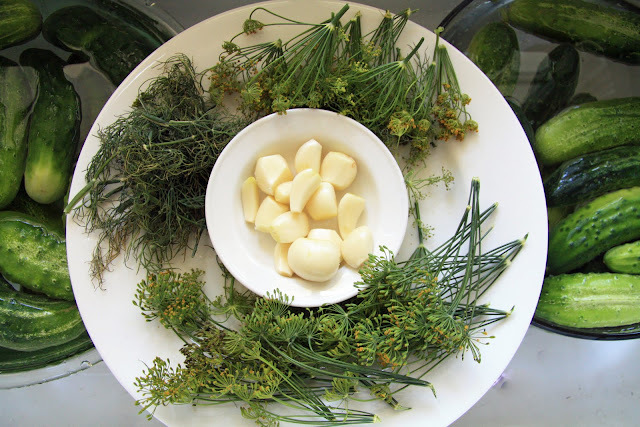 Can I use drydill instead of fresh? I couldn't find in the recipe where you gave these pickles a water bath. Did the seal ok without it?